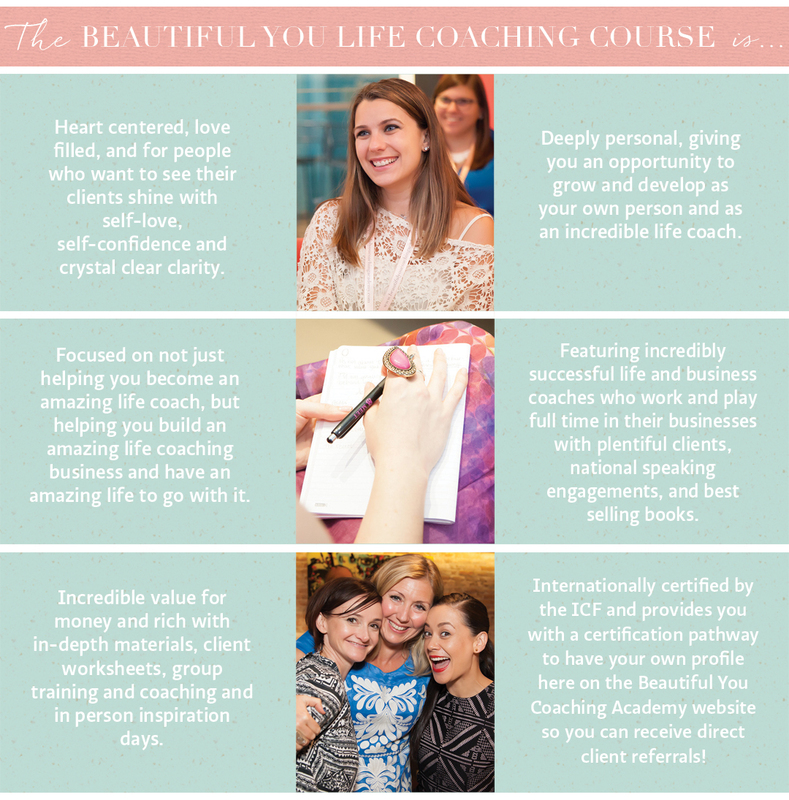 The Beautiful You Life Coaching Course is for people just like you – people who want to make a difference, see others grow and shine, work with people they love and feel connected to – and yes – create their own business and a life they love. When you study with us to become a life coach you will learn that we are passionate and proud about life coaching and the life coaching industry. And that’s why we have undertaken the rigorous pathway of applying for certification of the Beautiful You Life Coaching Course through the world’s peak coaching body – the International Coaching Federation. The ICF are the global leaders of coach education and they do not certify just any course. It must meet high level standards relating to content, ethics, materials and qualifications of trainers and support staff. And so we are proud – very proud – to have received certification through them to become an ICF Approved Education Provider. Have you been thinking about the type of life coach you want to be and how you know in your heart you will best work? Using all your current skills, gifts, talents and life experiences in a way that feels inspiring and meaningful for you? In every Beautiful You Life Coaching Course you have the support of not one but three trainers. 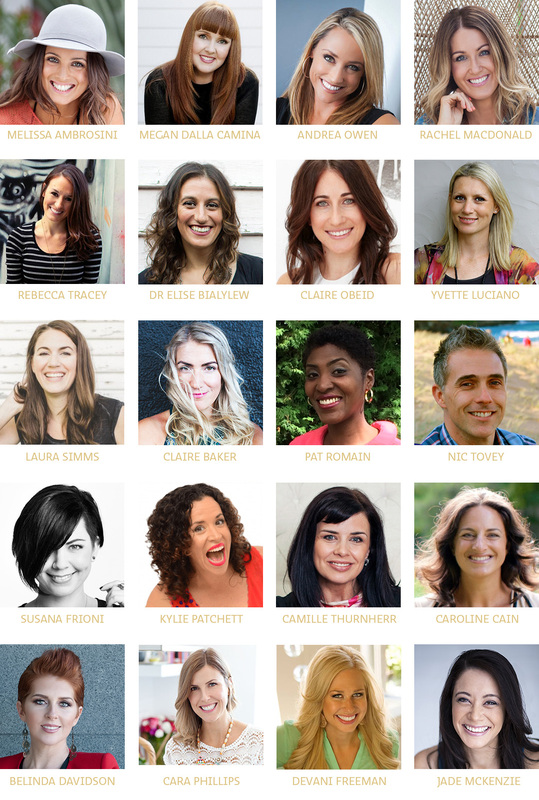 Julie and two of these amazing women and Certified Beautiful You Life Coaches who come to you with a wealth of coaching, counseling, career, event, and business skills and experience that YOU get to access every step of the way. They are also a ton of fun, inspiration and guidance and continually go above and beyond to ensure you have an amazing experience. 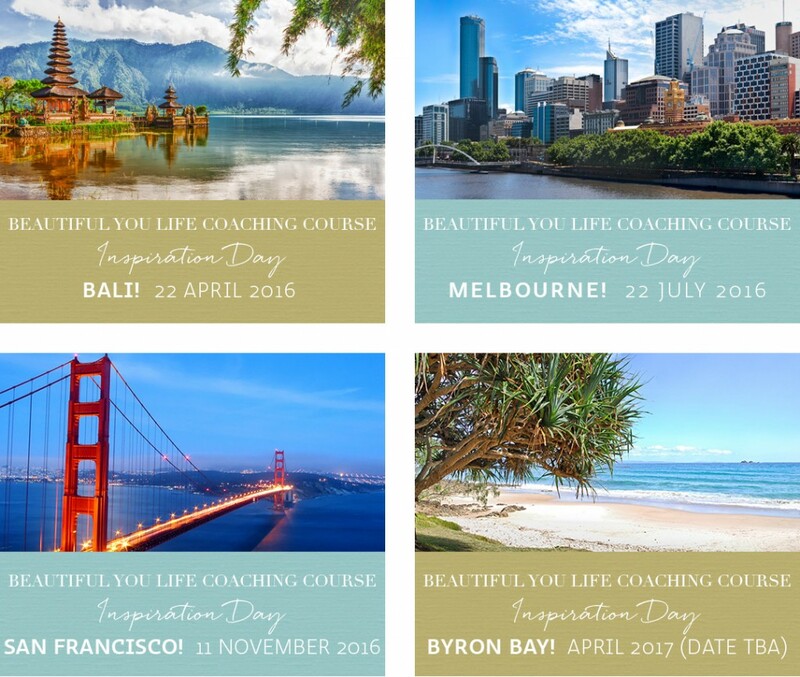 Are you the sort of person that likes to have even more detail about what you are going to be doing throughout the Beautiful You Life Coaching Course? Ok then! This is for you. 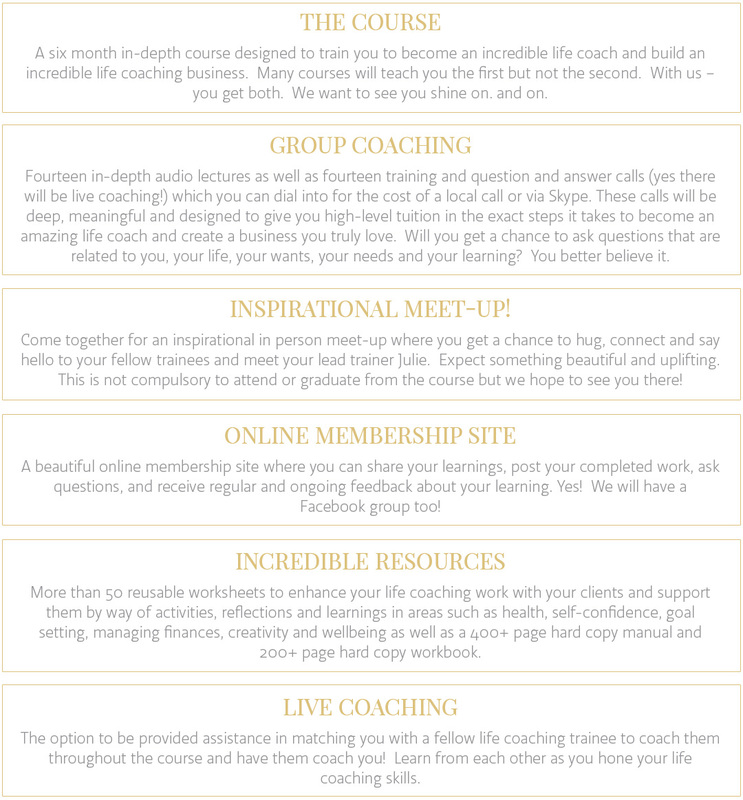 The following are the fourteen core modules of your Beautiful You Life Coaching Course training all of which include dedicated modules in your printed materials, an audio lecture, an in-depth question and answer call and incredible online support as you do so. We’re with you the whole way. 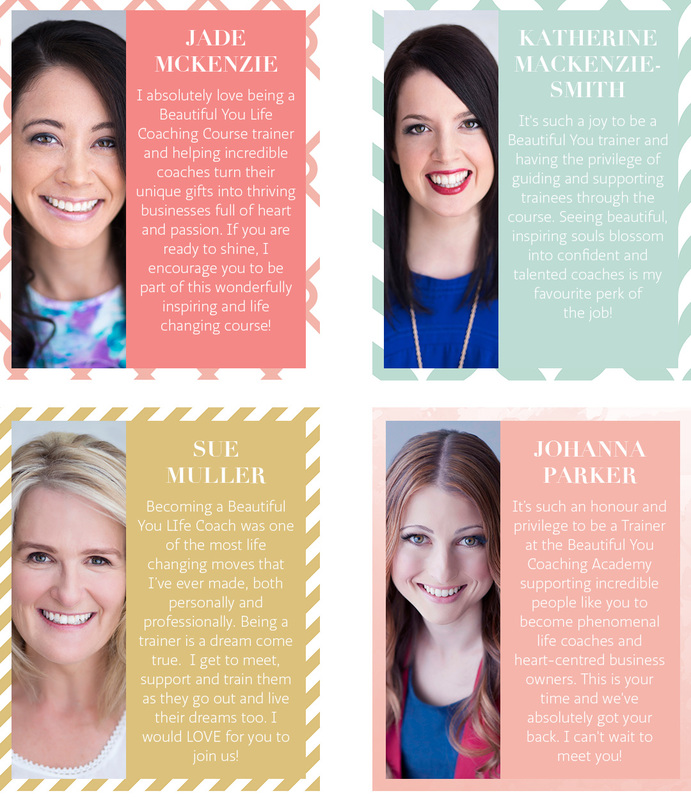 And as well as Julie as your lead trainer, take a look at who makes up the Beautiful You Coaching Academy faculty! 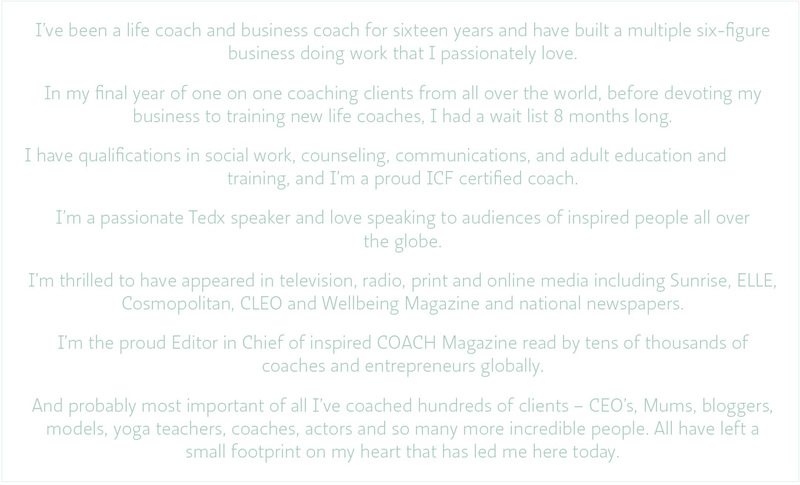 You will be learning from the following incredible coaches and entrepreneurs. 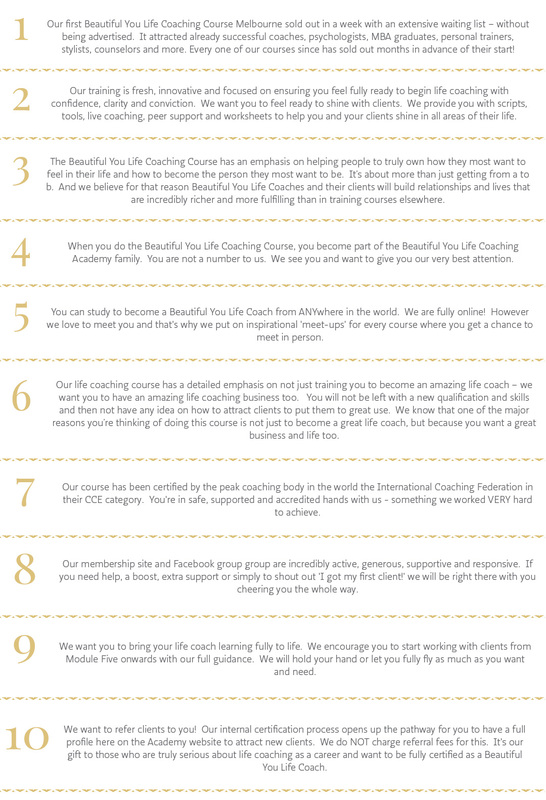 Here’s 10 solid gold reasons to choose us as THE Life Coach Training Academy to get you the life coaching skills, business acumen and mindset you need to becoming an amazing life coach. One of the great things that coaches must learn how to do is ask their clients amazing, soul seeking questions. 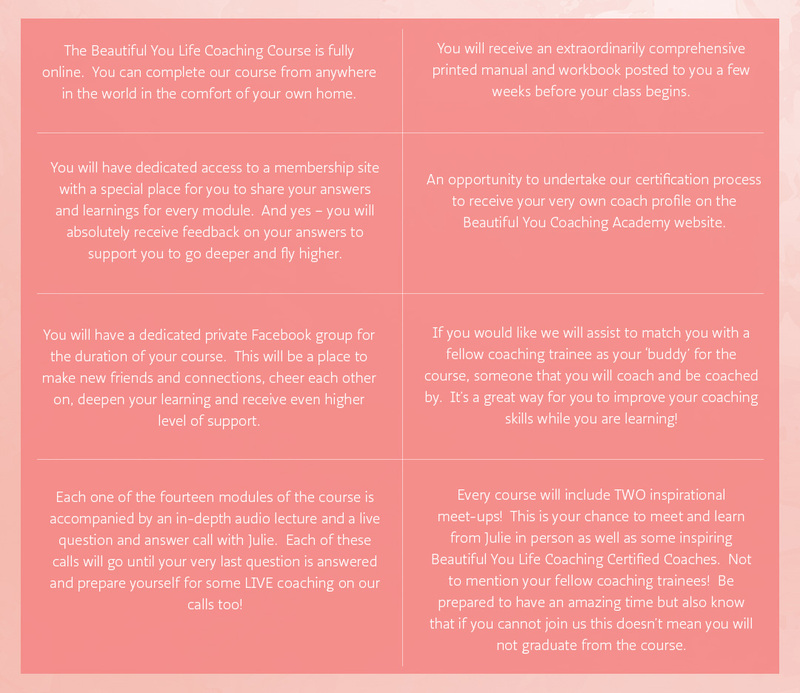 And so if you have some of those about the Beautiful You Life Coaching Course – we love you already! Here are some of our most frequently asked questions to help you dive in further. 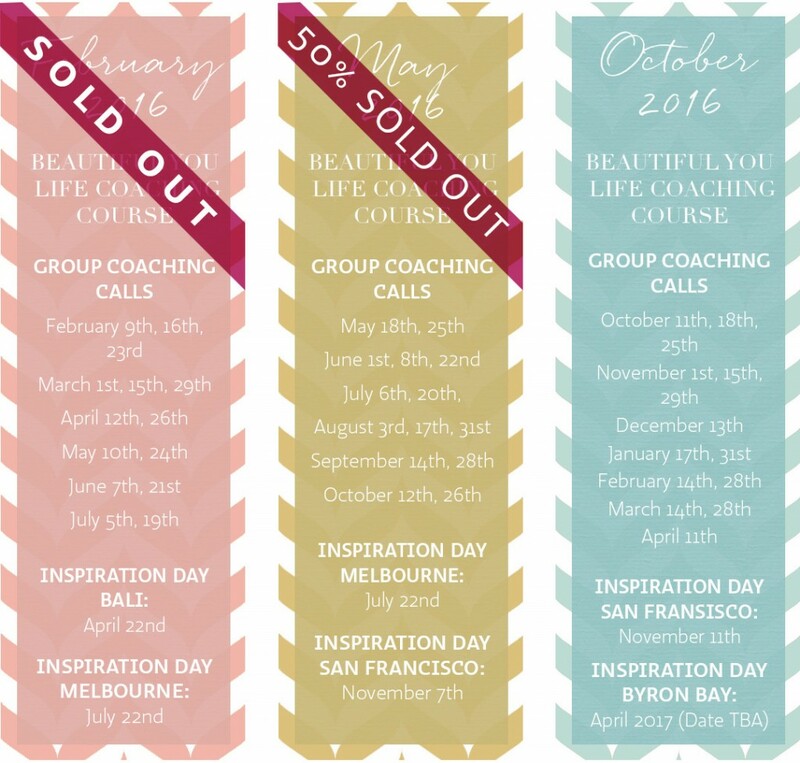 In 2014 and 2015 all Beautiful You Life Coaching Courses SOLD OUT months in advance of the start date. Months! And this will undoubtedly happen again in 2016 too. 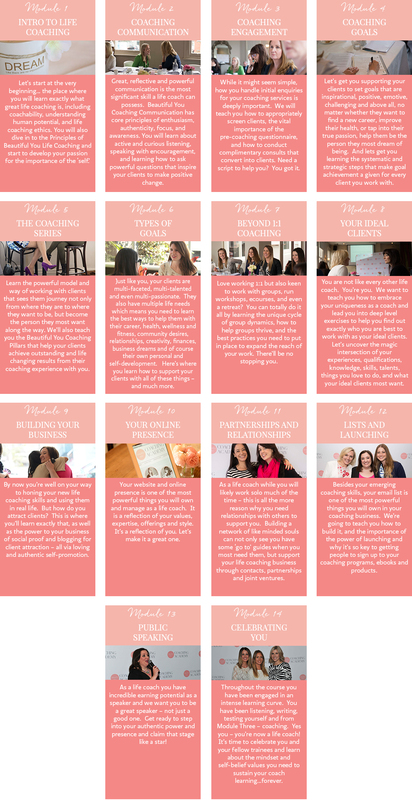 In 2015 we will only be offering three Beautiful You Life Coaching Courses. Each course will have a day and evening option for calls with times suitable for everyone from Melbourne to Manila, New York to Newcastle, Los Angeles to London! We have already trained coaches from Australia, New Zealand, Canada, Hong Kong, Singapore, France, Spain, Belgium, USA and the United Kingdom. And we can’t wait to learn where YOU are from too! We only take limited numbers of new trainees into each of our courses. We want to give you our fullest attention and service possible and we don’t believe that’s possible in a class of hundreds. So if you’ve been thinking about, dreaming about, or even longing to become a life coach now is your time beautiful. Right now. Please note that all coaching calls take place at not one, but TWO times during the dates noted. 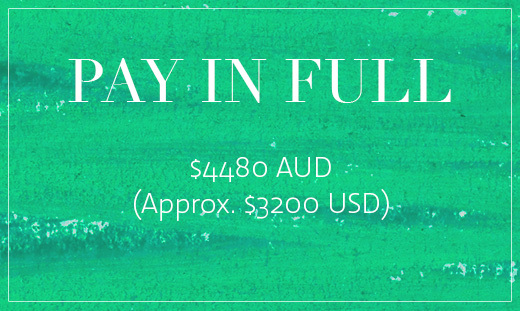 We offer you the option of a morning call at 11am Australian Eastern Standard Time or 7pm Australian Eastern Standard Time for every course. So if you can only make your calls during the day or night – we have you beautifully covered. And in even better news these times work super well across many timezones giving day and evening connection options for those of you in timezones that cross New York, Los Angeles, London, Hong Kong and throughout Europe – in fact the world! Please use this simple time zone converter to see how 11am Australian Eastern Standard Time and 7pm Australian Eastern Standard Time works for you. And these are the beautiful cities that we will be setting up gorgeous opportunities to meet you in person. We offer not one but TWO options for you to attend an inspirational gathering with Julie and senior Beautiful You Certified Life Coaches for every course we run. And (shhhhh!) there just might be a very special guest speaker or two there as well! Can you come to both if you would like for your course? That would be a big yes! 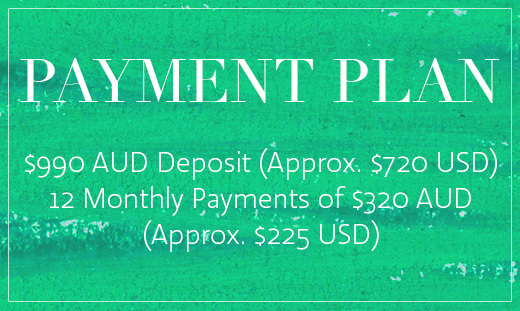 We are so passionate about helping you become a life coach that we offer an incredible 12 month payment plan and we encourage you to enrol asap so you do not miss your place. Please do not leave your enrolment until later to the time of your course starting or like so many others, you run the risk of missing a place. We turned away so many people in our 2014 and 2015 courses and we don’t want that to happen to you!